Ooh, so dark and brown. I love it. Glad to know the KA worked! It’s sweet creamy heaven in a ramekin! Nice pictures. I used my KA too, and it worked just fine for me. That looks divine. I wouldn’t mind eating that for breakfast! I might try to use the KA next time.. less mess! Your pudding looks nice and shiny! I’m using my KA next time too because I’m making a bigger batch. I love the little white ramekins with a mint sprig-so pretty. The peach crisp looks so yummy too. Mmmmm, a pool of chocolaty goodness. Good to know the KA works. Now I can pack my food processor! it looks lovely with the mint sprig! yum 🙂 glad the KA worked well for you. yum…i had to use my mixer too! yours looks so good though! Great idea with the mixer! I’ll have to try that next time! It looks delicious! Wow. 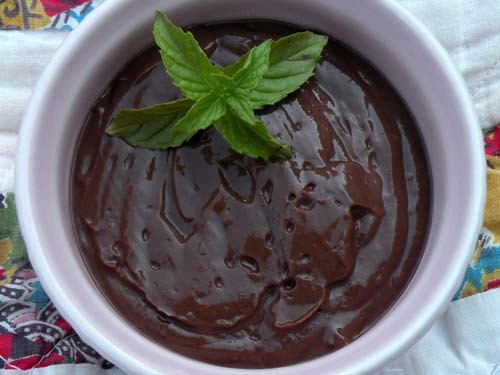 The dark chocolate pudding with the green mint is stunning. Great job! Mmmmm, nice picture! 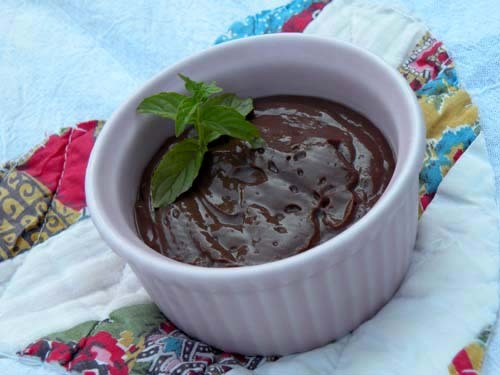 Makes me wonder what Dorie’s chocolate pudding with a little mint steeped in the hot milk would taste like… yumm! Your pudding looks great and I really love your pictures! They look as comforting as the pudding! I think I’ll try my KA next time too, thanks for sharing your tip! 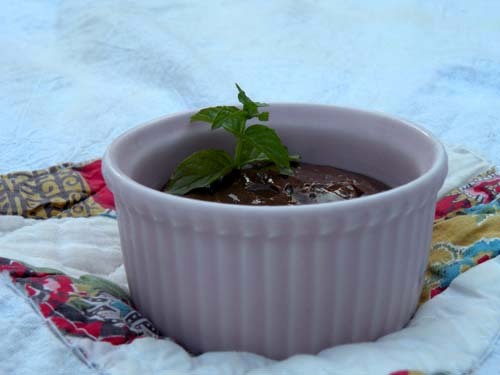 I really like your pictures and the mint leaf adds a wonderful touch to your really good looking pudding. I look forward to your post next week! Beautiful… great job! I also employed the Kitchen Aid with good results.